Novissima ac prae caeteris alus accuratissima Regni et Insulae Hiberniae delineatio in qua sunt Lagenia, Ultonia, Connachia et Momonia Provinciae divisae in triginta duos Comitatus qui et sunt divisi in omnes subjacentes Baronnatus. 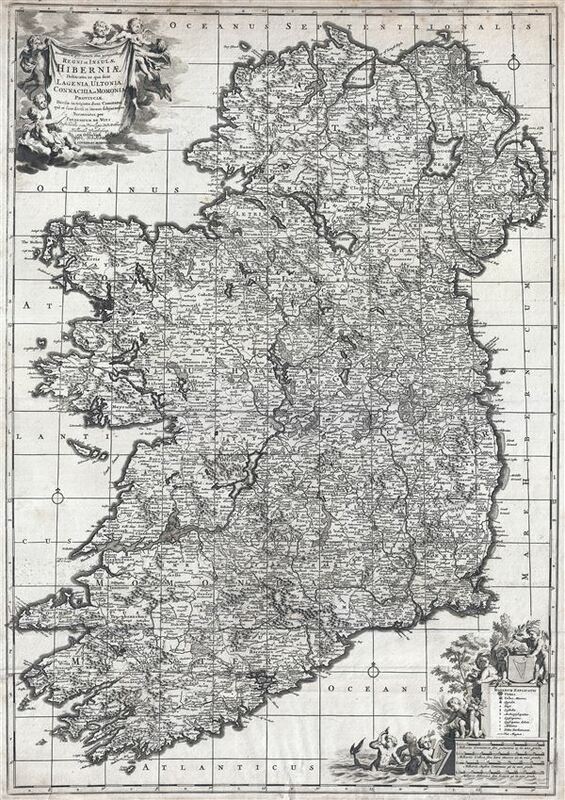 An uncommon large format map of Ireland by Frederik de Witt. This is the c. 1721 Covens and Mortier edition of a map originally issued in 1690. The map covers the entirety of insular Ireland in considerable detail. Counties, roadways, rivers, swamps, forests, and mountain rangers are noted. Topography is rendered in profile. The whole exhibits considerable accuracy giving ample evidence to Ireland's long cartographic history. Two decorative cartouches decorate the upper left and lower right quadrants. These feature the map's title, scale, and key. The primarily decorative cartouche-work includes various putti, mer-people, and an Irish Harp. Separate scales are offered in German, French, English, and Irish miles. That map, printed shortly following the 1721 Covens and Mortier acquisition of De Witt's plates from Maria De Witt, exhibits few substantive revisions over the 1690 edition beyond the title-area incorporation of the Covens and Mortier imprint. Very good. Two sheets joined by publisher. Minor soiling. Minor verso repairs to margins.